University of Chicago Press, 9780226244884, 128pp. 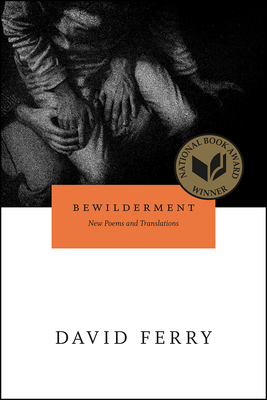 To read David Ferry’s Bewilderment is to be reminded that poetry of the highest order can be made by the subtlest of means. The passionate nature and originality of Ferry’s prosodic daring works astonishing transformations that take your breath away. In poem after poem, his diction modulates beautifully between plainspoken high eloquence and colloquial vigor, making his distinctive speech one of the most interesting and ravishing achievements of the past half century. Ferry has fully realized both the potential for vocal expressiveness in his phrasing and the way his phrasing plays against—and with—his genius for metrical variation. His vocal phrasing thus becomes an amazingly flexible instrument of psychological and spiritual inquiry. Most poets write inside a very narrow range of experience and feeling, whether in free or metered verse. But Ferry’s use of meter tends to enhance the colloquial nature of his writing, while giving him access to an immense variety of feeling. Sometimes that feeling is so powerful it’s like witnessing a volcanologist taking measurements in the midst of an eruption. Ferry’s translations, meanwhile, are amazingly acclimated English poems. Once his voice takes hold of them they are as bred in the bone as all his other work. And the translations in this book are vitally related to the original poems around them. "This is one of the great books of poetry of this young century."